Blurb: When Ruby woke up on her tenth birthday, something about her had changed. Something frightening enough to make her parents lock her in the garage and call the police. Something that got her sent to Thurmond, a government ′rehabilitation camp′. Ruby might have survived the mysterious disease that killed most of America′s children, but she and the others had emerged with something far worse: frightening abilities they could not control. When the truth comes out, Ruby barely escapes Thurmond with her life. Now on the run, she is desperate to find East River, the only safe haven left for kids like her, and she joins a group of other runaways who have escaped their own camps. Liam, their brave leader, is falling for Ruby, but she can′t risk getting close. Not after what happened to her parents. When they arrive at East River, nothing is as it seems, least of all Liam. But there are also other forces at work, people who will stop at nothing to use Ruby in their fight against the government. Ruby will be faced with a terrible choice - and one that may mean giving up her only chance at having a life worth living. 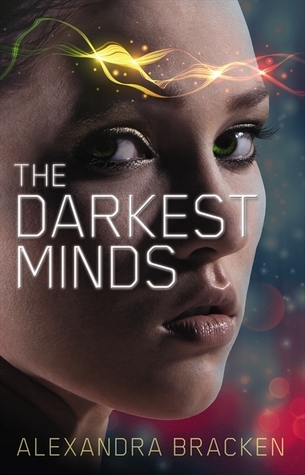 Review: ‘The Darkest Minds’ is one of those books which is just surrounded by hype, therefore I felt a little bit nervous about actually reading it. It took me a while to actually pick it up, but once I did I finished the whole book in the space of a couple of hours. It was completely not what I was expecting it to be. I had ideas of what I thought it was but it exceeds most of my expectations. I loved how everything was done. I especially liked the world- it was different. Dystopic without being too dystopic, there was still that connection to our world that I think sometimes gets lost in other books of this genre. I liked learning about all the different groups- like the ‘reds’ and the ‘greens’ etc. and I thought that was really nicely done. The plot itself was awesome- I liked how there were the setbacks and difficulties in the character’s journey rather than just making it simple. This being said, there were a few moments where it felt like the story was dragging on a bit or lacked action or seemed to be irrelevant to the actual story but all in all I think the pacing was done reasonably well. As for the characters... I liked Ruby well enough. I really liked how she developed through the story- it wasn’t like she was suddenly a new person as soon as the main plot of the story kicked in, she grew as the story did. Liam was just. In a way, he kind of reminds me a bit of an Adam-like character (from Shatter Me by Tahereh Mafi), but in other ways he was completely different. It was nice how he looked after Ruby, Chubs and Zu and treated them all with respect. I think that’s not often something you see in a YA love interest, especially in dystopia. I just feel like he was a well-rounded character and incredibly realistic. Chubs, of course, is just some kind of awesome human being. I loved seeing the friendship between him and Ruby grow and he is honestly someone you want as a best friend! But that ending. Look, I absolutely hate what happened because ALL THE FEELS but at the same time, my brain is like OMG, SO EXCITED! I can’t wait to see how everything is dealt with in the sequel.